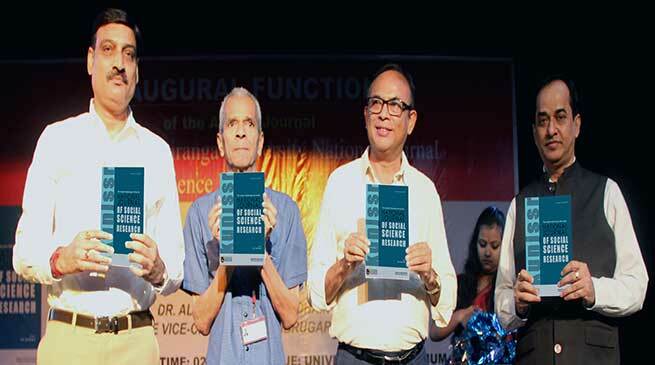 The Assam Kaziranga University releases its first Annual Academic Journal, “The Assam Kaziranga University National Research Journal of Social Science Research” (KUNJSSR) Published by the School of Social Sciences. The first annual journal of The Assam Kaziranga University entitled, “The Assam Kaziranga University National Journal of Social Science Research” (KUNJSSR) published by the School of Social Sciences was formally released by Dr. Alak Kumar Buragohain, Honourable Vice-Chancellor, Dibrugarh University in a meeting held on 25th of July, 2017 at the University Auditorium. Besides the faculty members and students of the university, the function was also attended by Shri Basant Khetan, Honourable Pro-Chancellor of Kaziranga University, Dr. P.K. Mishra, President, North East Knowledge Foundation (NEKF) & Honourable Vice-Chancellor (In-Charge), Kaziranga University and Ms. Rainy Khetan, Honourable Director, Kaziranga University. Dr. Buragohain, while releasing the journal, appreciated such type of academic endeavour that has been put forth by the School of Social Sciences, Kaziranga University. He also stressed upon maintenance of high quality standards of research work. He further highlighted the merits of Choice Based Credit System (CBCS) that has been adopted by the University Grants Commission (UGC) in the undergraduate courses. In this context, he cited the examples of the prevalence of the system in the USA, UK, Canada etc. Prior to the release of the journal, Dr. P.K. Mishra delivered the welcome address and highlighted the need of industry-academic interface. Prof. B.N Borthakur, Dean, School of Social Sciences, who is the editor of the journal, introduced the guest Dr. Alak Kumar Buragohain to the august gathering and talked about the importance of research and publication, through which the image of an academic institution like a university is reflected. Mr. Hriday Ranjan Kalita proposed the vote of thanks at the end of the inaugural function.